Usually, I take two different approaches when transforming traditional recipes. I either use all the original ingredients, but prepare and serve them in a different (to my opinion more optimal) way. Or, I keep the same presentation, but use very different ingredients. All my Kaiserschmarrn variations belong to the latter category – though they were desserts only. This time I wanted to create a savory version using goat cheese – in a way uniting Käsespätzle with Kaiserschmarrn. In general, I try to find the corresponding counterparts for all traditional ingredients. For example, the traditional recipe calls for raisins soaked in rum. For the savory version I got inspired by the typical combination in a Bloody Mary, so I soaked sun-dried tomatoes in high-quality gin. Instead of orange or lemon zest and vanilla, I added herbs like thyme, rosemary and sage. Since my goat cheese purveyor – from whom I bought the cheese as well – offers kefir made from goat milk too, I replaced the milk from the traditional recipe by goat kefir. Usually Kaiserschmarrn is dusted generously with powdered sugar, so for the savory version I grated some aged goat cheese on the top. Finally, I poured bell pepper coulis and tarragon oil on the Kaiserschmarrn, which where the counterparts of the traditional apple puree. 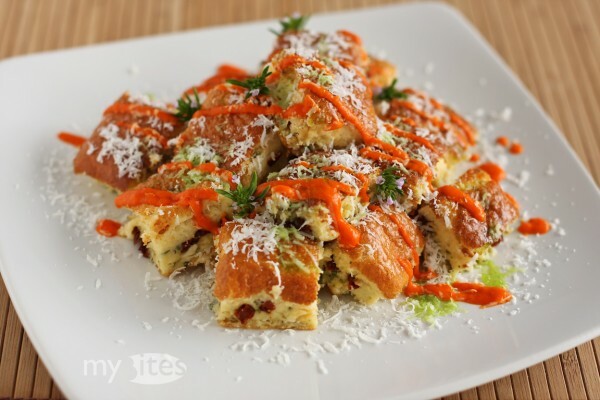 This entry was posted in Main Course, Vegetarian and tagged bell pepper, cheese, dough, dried tomato, eggs, flour, gin, goat cheese, herbs, kaiserschmarrn, kefir, main course, savory, tarragon, vegetarian on October 14, 2012 by Robert.